Let's just say after a year and two months of living in a small town I finally made the decision to jump into community here. You are probably thinking "Why haven't you done that sooner?" and I have an explanation. I moved to Woodward a week after getting married. I wasn't planning on being here long at all. I initially thought we would be gone and moved away by December of 2013. "Hooray! I will be free from small town life," I thought. Then, in August, Dave told me we would stay through December. I didn't love that idea but knew we needed to stay. Come December our lease was up for renewal and we had a 6 month option; which meant I would be in Woodward until June. "I can make it until June," I told myself. I had plans you guys! I vividly remember on the way to Hawaii, in full planning mode/voice, telling Dave that as soon as we got back from Hawaii (end of March) I was going to organize & throw out stuff in April. In May I'd pack and on June 1st we'd be out the door! "Hooray," I thought, "Bye bye small town!" We would visit the east coast, see family and be in Asia by August. Go me! Friends, It's June 26 and I'm still here. However, I'm thankful and wouldn't have it any other way. After planning, re-planning and re-re-planning the Holy Spirit used Proverbs 16:9 to turn on the lightbulb for me. 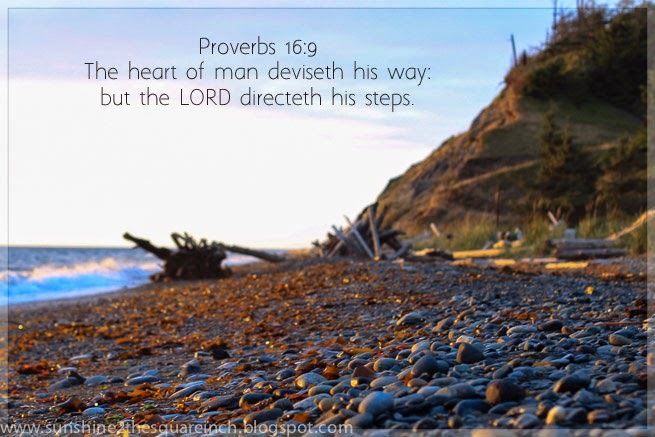 The verse says: the heart of man deviseth his way, but the Lord directs his steps. I can plan all I want but in the end God's plans are so much better than mine, and I'm so glad. Friends, it took me over a year but I finally just surrendered. Surrendered to His timing. Surrendered to His plans for me and my schedule. I don't know why God has kept me in Woodward so long but I can tell you that it's been good for me to learn that life doesn't revolve around me. It's about God and what He wants. I don't work full time and I'll be honest, there have been some super lonely days; which although they are hard, I'm thankful for. Having so much alone time I started volunteering at the senior center which in turn opened my eyes to how the elderly people need friends. I would have never learned that if I weren't lonely. I've also seen God provide just what I need. When I was at my wits ends going bonkers from being home all day God opened the door for me to watch little Isaac two days a week. His Mom is one of my best friends here and such an encouragement in my walk with Christ. When I panicked at the beginning of this summer, not knowing what I would do, God provided a part time job for me at the water park. I might be here this fall and I know God has something for me. In the mean time, I finally made the decision to intentionally build relationships here, where I can. Dave and I travel a lot on the weekends, either back home or to a new place so building community hasn't been a huge priority. That also means I have Monday through Friday to be intentional. I'm not sure why I haven't made it a priority before and in a way I regret not doing so earlier. However, I'm really glad God finally opened my eyes and heart and showed me that there are wonderful people right here to get to know and to grow closer to Christ with. I don't know how long I'll be in this town but I'm excited to see what God has! He is good, friends and has made us to build up and encourage each other. I don't know what your situation is but I hope you'll plug in where you are and see God work. How is community where are you are at? 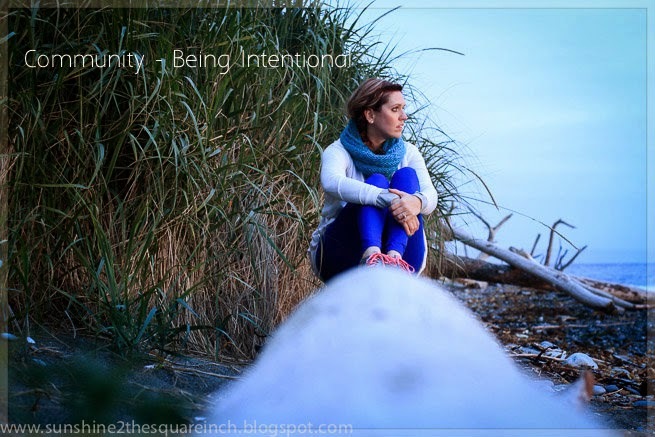 Are you intentional? thanks for sharing Beka! it's such a hard thing to do - to just surrender control to Him but it is so worthwhile! :) oh how he must laugh at our plans sometimes! :) glad to see that you are learning & being intentional in this time even though it may not be your first choice! Community is so important!!!!! Walking with other believers has been so pivotal in my relationship with the Lord and Colby and I are both so blessed to have a huge group of friends to do life with!! So glad you have been intentional! Ah... waiting is so hard for me, especially when I know exactly what I want. But I found peace when I let go of my plans. I think diving into community will be so rewarding and you will fall in love with your small town even more! Thanks for sharing! Thanks for being honest and sharing with us. I know I've made comments about how lucky you are to not have to work and be able to do whatever you want all day. But I've done that actually, and I know it gets boring after a while. I'm glad God has brought you opportunities to work, and I'm glad you are able to volunteer at the senior center. I bet they love you there. Hopefully we can meet up again or a few times before you leave! I'm glad you and Colby have a huge group of friends where you are at. That is really neat. I'm glad you understand where I'm coming from. I will say if there is one thing I've learned from this is that I need to start being intentional from day 1 even if I know I'm not going to be there very long because ... I really could be there a long time. Letting go of my plans is freeing and peaceful! I think you are right that the more I invest the more I will love it here. I really do like it here I just never imagined staying so long. However, the longer I'm here and the more I get to know the people the more I realize what a great place it is. I'm glad God brought me opportunities to work too and I know that you have been there and know what that's like. I haven't been to the senior center in a few weeks but I love it! I love those people and they have blessed me more than I have them. I'm coming to see you in July! I don't know what date but I'll e-mail you dates this week. I love love love this post. First off, I can relate!!! It's so hard to really commit and dive I to community when you aren't sure how long you'll be there. It's so important though and I felt myself holding back from building a community in Korea & once I allowed myself to invest I felt more fulfilled. I also find it hard not to compare new community to old. I struggle between missing pieces of our old community! Am curious to hear more about this as you go on. Thanks for sharing and loved reading! Surrendering to His time . . . ah, that is so what I need to do. I'm so excited for you to get involved in your community! I am so happy to read this post! I totally understand about being here for a little and BAM your longer than expected, alot longer. I am having wanting to get out and explore my community too. I saw your newer post and that's what lead me to this one. I'll be sharing this with partner so he can read it too. Thanks so much for sharing this.